The captain of the sunken South Korean ferry has been charged with manslaughter, reports say. Lee Joon-seok, 68, is accused of leaving the ship as it was sinking while telling passengers to stay put, reports Yonhap news agency. The Sewol ferry disaster on 16 April killed 281 passengers, most of whom were high school students. Another 23 are still missing. Besides Mr Lee, three crew members - the chief engineer, the chief mate and the second mate - are also being charged with manslaughter. If convicted, they could face life imprisonment. "The [four people charged] escaped before the passengers, leading to grave casualties," prosecutor Ahn Sang-don told journalists. Meanwhile, the results of an interim investigation has found that a sharp turn was the main cause of the sinking, Yonhap said. The Sewol "made a sharp turn at a 15 degree angle before tilting and capsizing", Yonhap reported, quoting police and prosecution officials. The overloading of cargo and the lack of water in ballast tanks to balance the load made recovery from its sharp turn difficult, officials added. The captain of the ferry was not on the bridge when the ferry capsized, with a third mate at the helm. The authorities have also arrested several people who were not on the ferry at the time of the sinking. The latter is suspected of conducting poor inspections of the ferry's safety equipment. 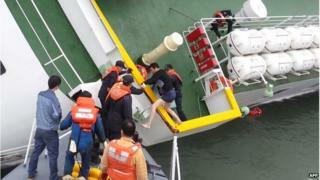 South Korea is looking to reform its safety and emergency response system in the wake of the ferry's sinking. She has previously apologised for the way the government handled the incident, amid questions over the initial rescue effort. Following the recent death of a civilian rescue diver, Seoul also plans to provide psychological help for rescue workers "suffering from physical and mental agony", said local media. Officials said that divers had spotted walls "getting weaker and about to collapse". Rescue workers are now plotting new routes through the hull.